When thinking of fall decor, so often the first things we imagine are pumpkins and gourds. 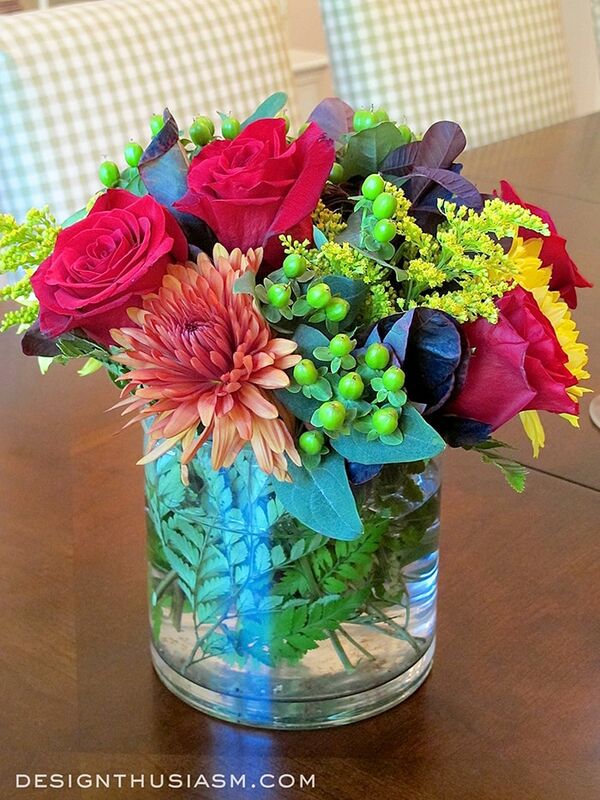 But fall florals can be a lovely way to celebrate all the season has to offer. 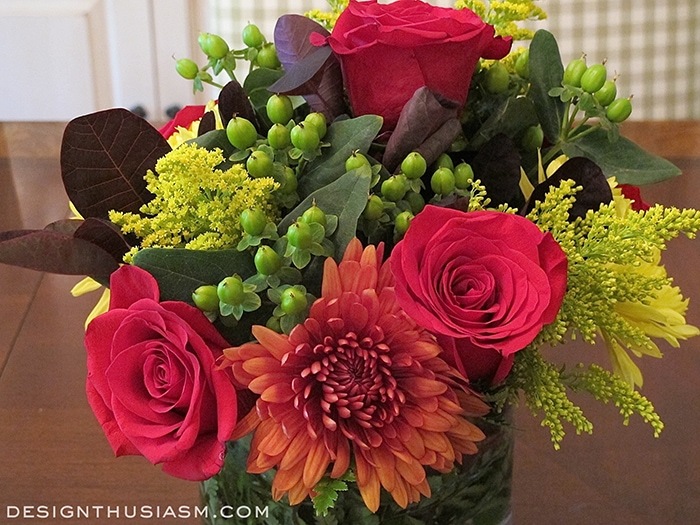 Last week I had a dinner party which gave me the opportunity to enjoy a medley of fall floral arrangements. In the kitchen I did a grouping of rich vibrant jewel tones. 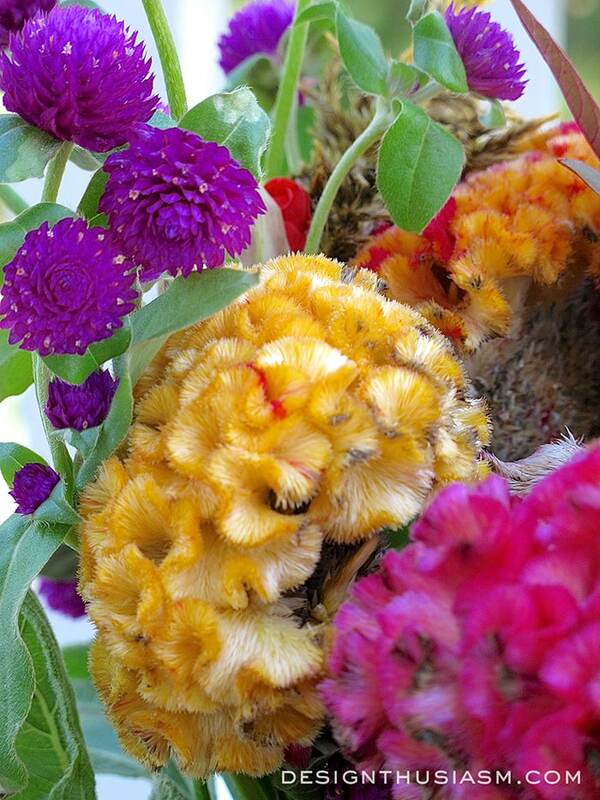 A base of honey colored mums served as the underpinning upon which claret gerber daisies were set. 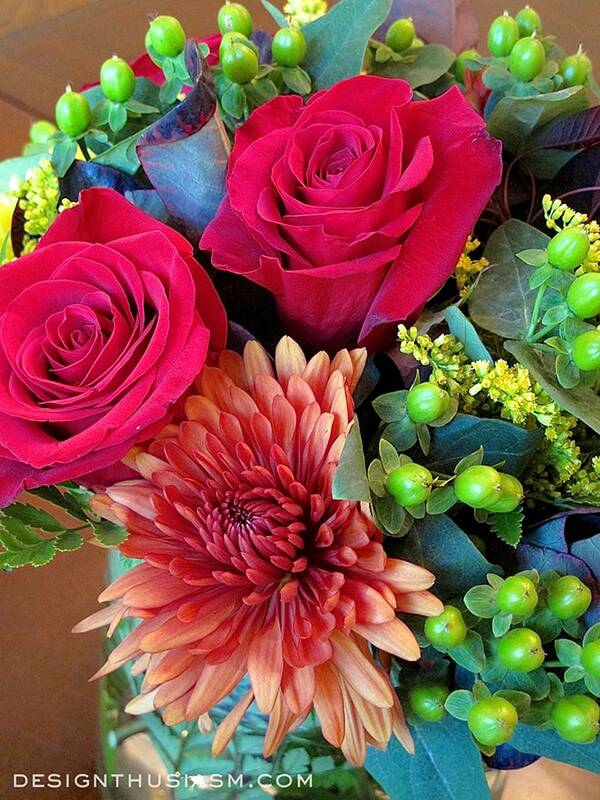 The pairing was then punctuated with two-toned roses which emphasized the warm depth of the palette. Bits of greenery finished off the simple cluster. 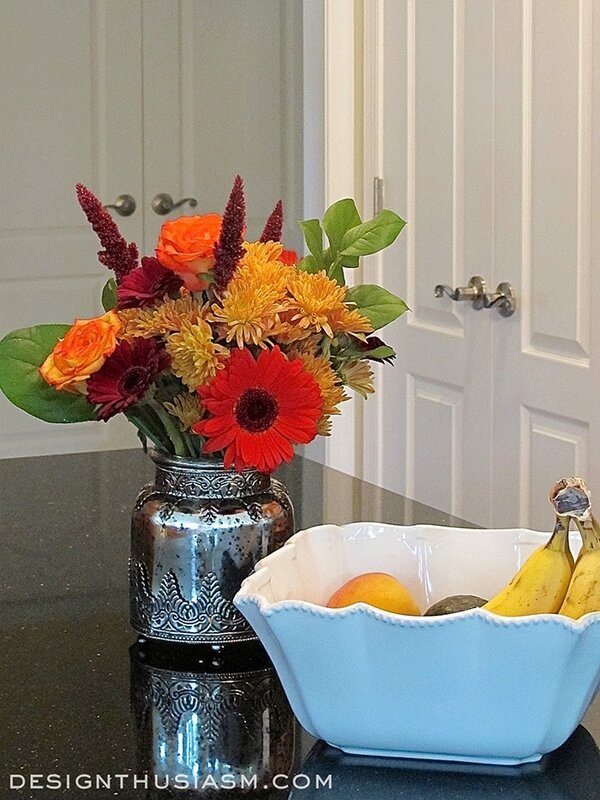 The arrangement was gathered in a mercury glass container and set next to a simple white bowl filled with fruits that mirrored the floral palette. Outside on our deck, a looser more casual arrangement was placed, with a bit brighter color feeling and more variation in shape. I actually have no idea what most of these flowers are called, so by all means help me out in the comments below. I can always count on my readers to fill in the missing information, attributable to my limited botanical knowledge. 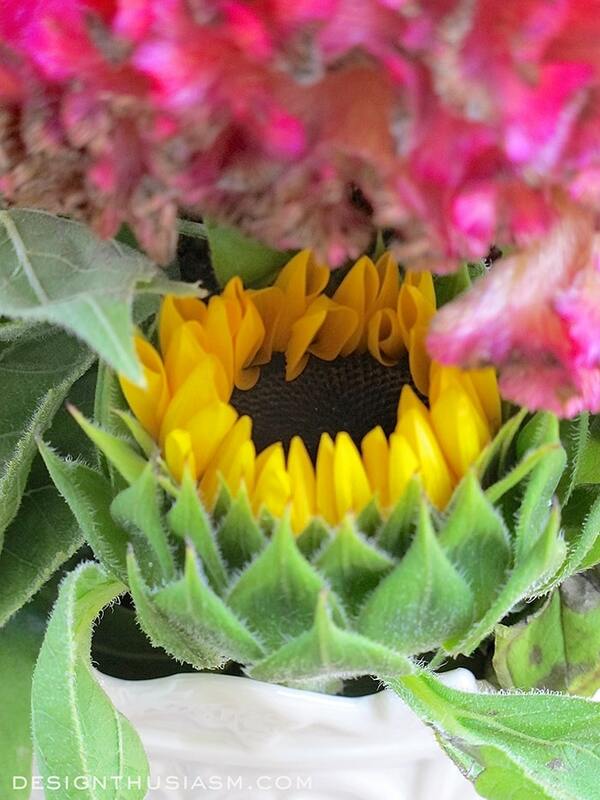 Of course, I recognize the sunflowers that add cheer to this grouping, a true fall signal that looks lovely bounced off of the pinks in the mix. 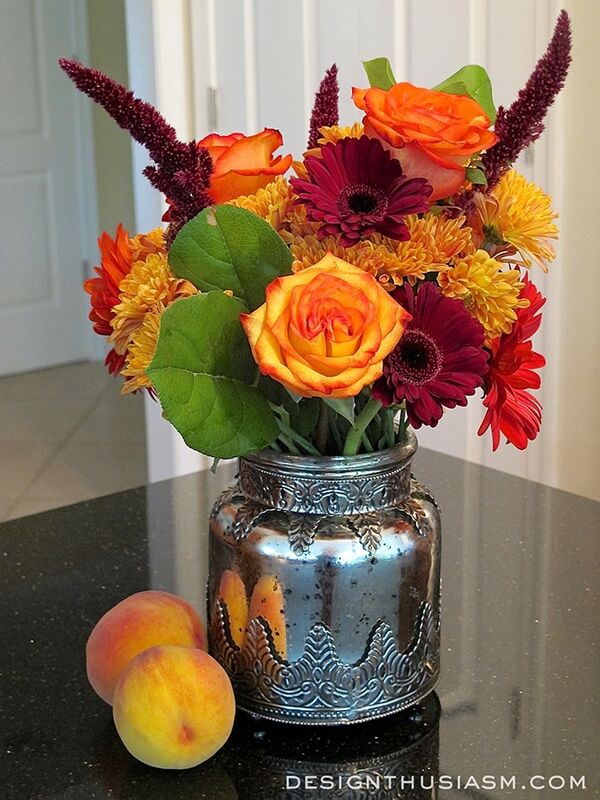 On the dining room table, I often use two or three arrangements. This time I used a pair, rich in tone and delightfully lush, albeit low enough to allow conversation to flow above them. The base of these clusters were cherry red roses warmed by their placement next to cinnamon hued dahlias. Leaves in both mossy green and aubergine added much to the presentation. The little green berries (name?) bring a harvest feel to the floral. A pop of sunny yellow adds a nice surprise. I’m a huge fan of fresh flowers and I often can’t get enough of them. I enjoy following the seasons with my arrangements and in the upcoming weeks, the reds and burgundies you see here will be replaced by oranges and coppers. Something to look forward to, indeed. 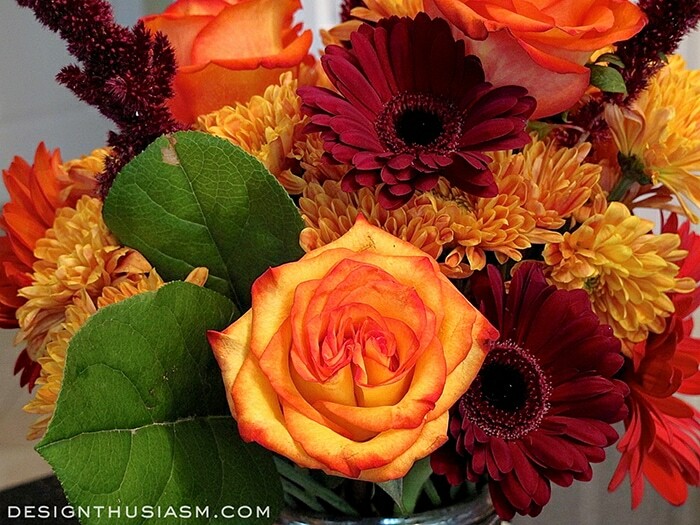 If you missed my early fall arrangement utilized in a transitional table setting, you can see it in the post 7 Ways to Bring Early Fall to Your Tabletop. Hi! 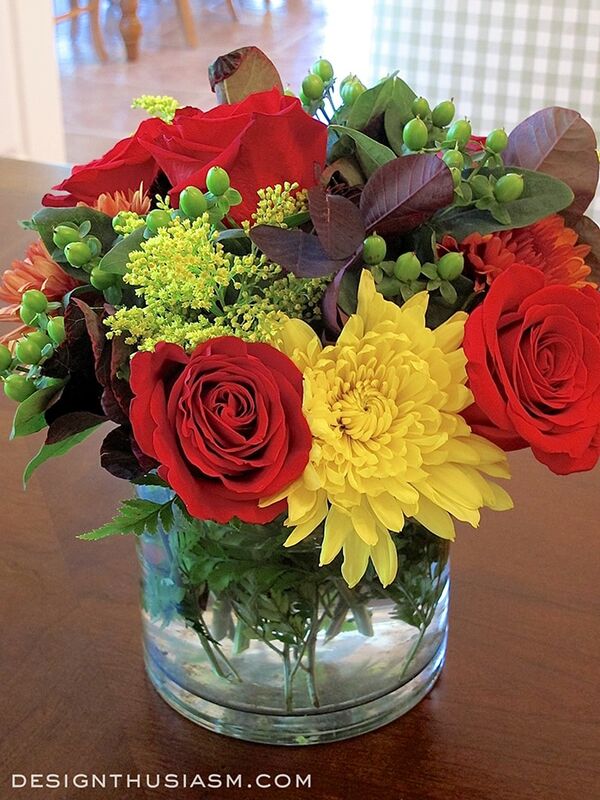 I just love your arrangements and like to spread them around our home, too. The house looks so cheerful with all the bright colors….makes me happy when I look at them. I love that you use your gorgeous silver pieces in your displays instead of just storing them in a china cabinet…..pretty, pretty, pretty! So glad cooler days are here, and our landscape is now starting to show some lovely colors. I try to take a little drive through the countryside every few days during spring and fall just so I don’t miss the beauty that always seems too fleeting to me. Thanks, Bobbi! I love to spend time outside too… 🙂 It’s such a lovely season. 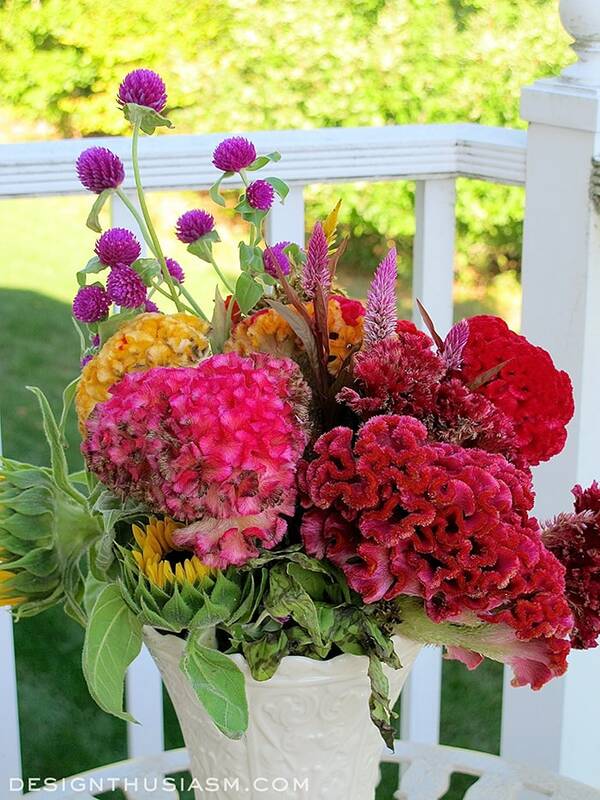 Beautiful arrangements and I love the containers!?? Gorgeous, stunning and spectacular! Wish I could afford to fill my house with arrangements like these! Found you through Between Naps on the Porch – I’m a new fan! Thank you and welcome!! I wish I could fill my house with flowers all the time too… 😉 This was for a family celebration, but most of the time I’m lucky if I have just one fresh arrangement in the kitchen. I do use faux florals a lot for that reason. While I prefer fresh, I’d rather faux florals than no florals. Thanks for stopping by!! Gorgeous! What a wonderful photographer you are as well. I just wanted to say I love following your blog. I particulary like your tablescapes and flower arrangements, being an enthusiastic, but amateur flower arranger and tablescaper myself. 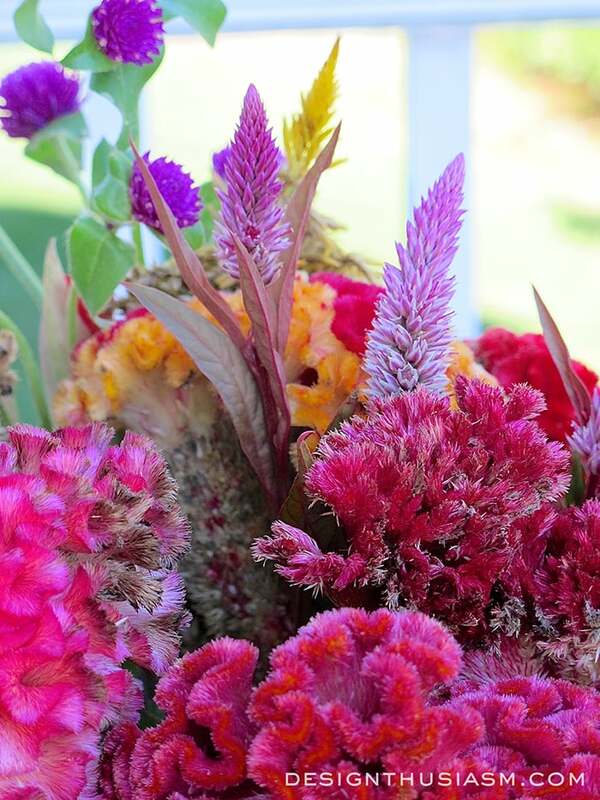 I can give you answers to a couple of your queries; on your deck, the large headed flowers are Celosia cristata (also known as cockscomb), the pointed feathery flowers are another variety of Celosia; Celosia argentea. Both varieties come in fantastic, vibrant colours. I don’t know what the tall blue flowers are. In your table arrangements the berries are Hypericum. This plant has yellow flowers, although I think it is mostly used for the berries, which you can get in different colours. Thank you again for your wonderful work, I look forward to your next post. 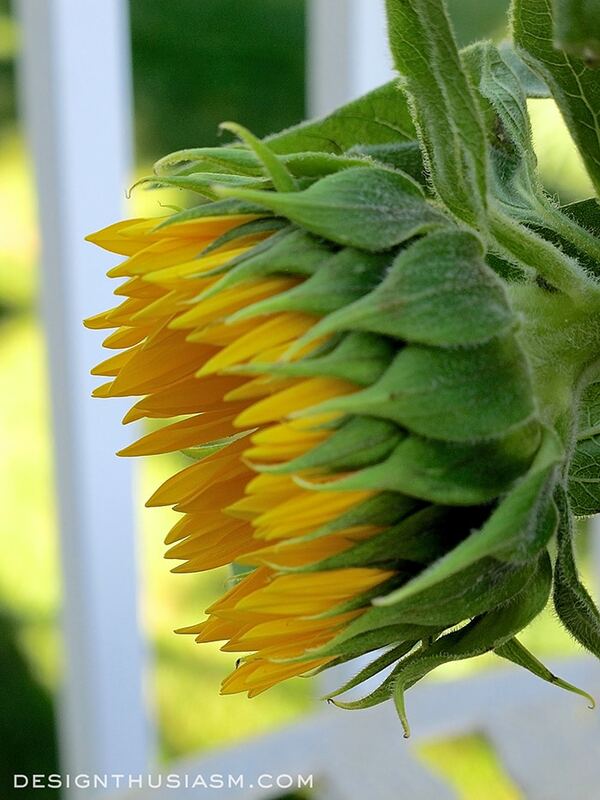 Thank you so much, Cindy, for your kind words and your help identifying the flowers! I so love flowers but I’m terrible at knowing their names. I’ve been thinking of doing more arrangements, perhaps a floral of the month thing, but it’s hard for me to write about them given I never know what they are… lol! I need to remember to ask the florist when I purchase the stems!! Beautiful, Lory! Every single one of them! Very Beautiful Lory! 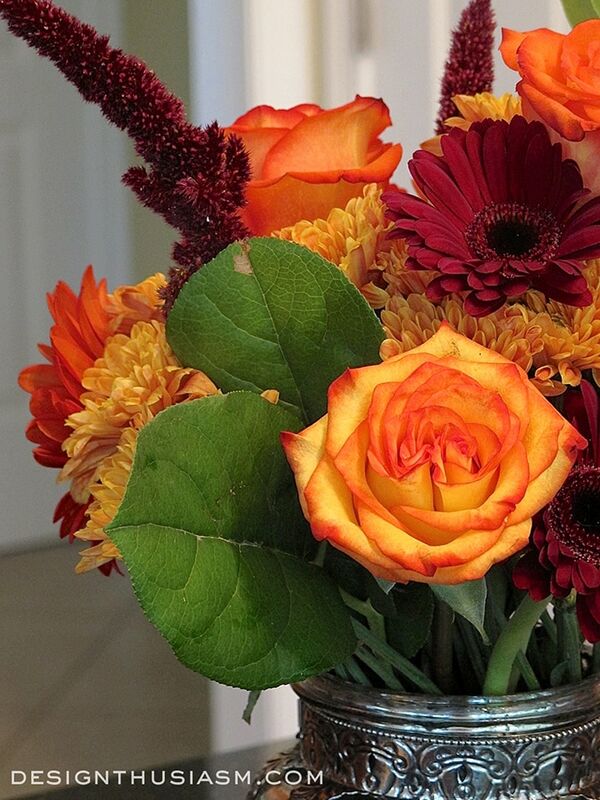 Nothing like gorgeous flowers to bring fall into your home! Thanks for sharing with SYC. 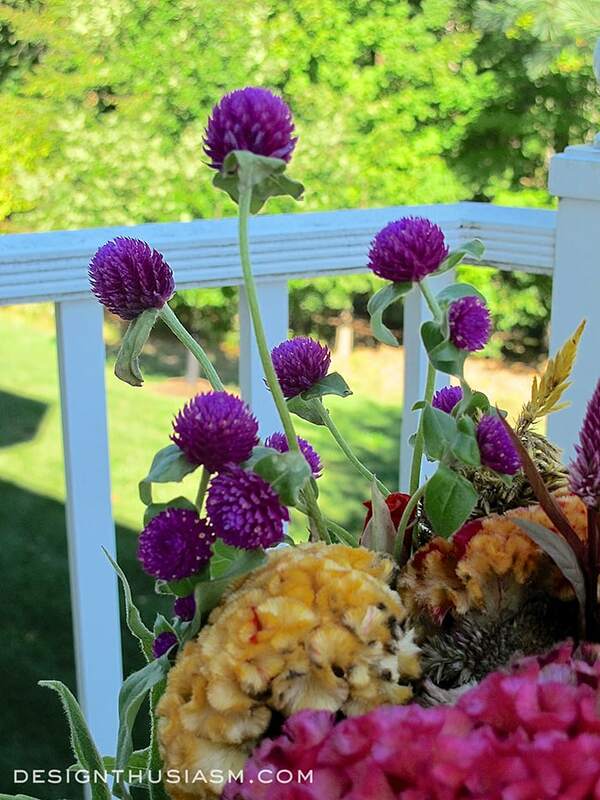 The taller ball shaped purply flowers are Globe Amaranth(they also come in a gorgeous red shade :^). The taller spiky purple or yellow ones may be the top of Veronica. The green berries are Hypericum, and the fluffy yellow in that arrangement is Goldenrod. They are all lovely, and your containers are perfect!! Thanks so much! I definitely need a reference book… lol!